How to watch Pocoyo: Season 4 (2007) on Netflix Canada! Yes, Pocoyo: Season 4 is now available on Canadian Netflix. It arrived for online streaming on November 29, 2018. 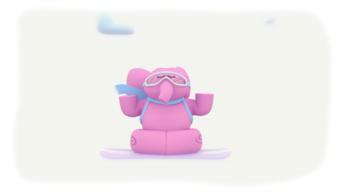 We'll keep checking Netflix Canada for Pocoyo: Season 4, and this page will be updated with any changes. Discovery is the name of the game for friendly toddler Pocoyo in this lifelike and richly colored animated adventure series for preschoolers. He looks like a regular kid, but get ready! This little guy visits the stars above and the ocean below. Season 1 of Pocoyo has 13 episodes. Because different Netflix countries have different availability for episodes, you'll need to check the episode listing below to see which are available in Canada. Umbrella, Umbrella / Drum Roll Please / Swept Away / Who's on the Phone? Pocoyo finds an umbrella. / Pocoyo and his playmates love dancing to the Ball Orchestra's music. / Pocoyo shows us that tidying can be fun. Pocoyo and Loula are going to the beach, but have lost their ball. / Pocoyo has an unusual new friend. / Pocoyo makes a special present for Elly. Elly has a cold and is sneezing too big. / Pocoyo has to figure out who has a camera. / Pocoyo and his gang want to make friends with a butterfly. The Key to It All / Keep Going, Pocoyo! / Sleepy Bird's Surprise / Where's Pocoyo? 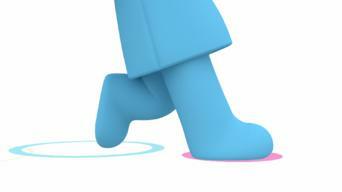 Pocoyo finds a key which leads him on a magical adventure. / Pato and Elly enjoy a skipping rope. / Sleepy Bird's egg takes on a life of its own. Pocoyo wants to drum, but his friends are all busy. / Elly and Pocoyo have a race. / Pocoyo is left in charge of guarding the castle Elly built. Pocoyo gives the last drop from his watering can to his friends. / Pocoyo and Elly play restaurants. / Elly finds a star that fell from the night sky. When Pocoyo sends a letter to Elly, Pato is the postman. / Pocoyo neglects Loula when he finds a toy dog. / It's time to play baseball with Octopus. A model airplane shoots off into space. 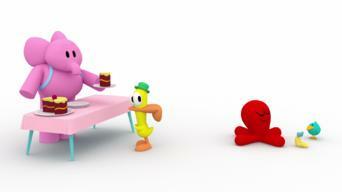 / Pocoyo's friends give him a surprise party. / Pocoyo and Pato have a ball that takes on a life of its own. Pocoyo and Pato have too much luggage for their camping trip. / Pocoyo discovers his echo. / Elly inadvertently sets off on a fantastic journey. Pocoyo is impressed with Octopus's juggling. / Pato, fresh from a shower, tries to keep clean. / Pocoyo pretends to be an elephant, a duck and a dog. Pocoyo imagines that fish live in different places and draws funny pictures. / It's Whale's birthday. / Pocoyo befriends a hungry caterpillar. Bedtime / A Little Something Between Friends / Giggle Bug / What's in the Box? 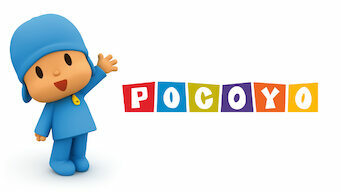 It's Pocoyo and Pato's bedtime but Pocoyo isn't tired. / Pocoyo and Pato build a wall between themselves. / Octopus tries to get Pato to giggle. Pocoyo and Pato have great fun playing with some magical blocks. / Pocoyo has decided to paint a portrait. / Pocoyo looks after Elly's favorite doll. Season 2 of Pocoyo has 13 episodes. Because different Netflix countries have different availability for episodes, you'll need to check the episode listing below to see which are available in Canada. Pato gets stuck hanging upside down. / Pocoyo finds a super machine that mixes objects. / Pocoyo makes a mess and leaves it for friends to clean up. 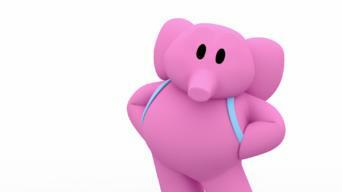 Pocoyo's Present / Elly's Ballet Class / Pocoyo's Balloon / Who's Calling Me Now? Pocoyo has a beautifully wrapped up present but he won't open it. / Elly wants to be a prima ballerina. / Pocoyo accidentally lets go of a balloon. Pocoyo is too scared of a new slide. / Elly gets a fancy new pair of dress shoes. / Pocoyo finds a strange door that leads to the sky. Pocoyo finds old rubbish and decides to clear it out. / Pocoyo promises to teach Baby Bird to drive the Vamoosh. / Elly's darling doll is missing. Pocoyo goes to visit his alien friend. / Pocoyo makes a new game called BOO! / Pocoyo is having a party and invites all his friends. Baby Bird is in awe of Pocoyo as he plays skillfully with a bouncy ball. / Pato thinks Loula stinks. / Pocoyo finds a seed and plants it. Pocoyo finds a machine that makes things invisible. / Pocoyo, Elly and Baby Bird make a lot of noise. / Sleepy Bird needs someone to watch Baby Bird. Pocoyo is doing a magic show. / Pocoyo and Elly organize a picnic. / Pocoyo makes a puppet show. / Pato finds an egg and falls in love with it. An angry alien declares that he wants to be king. / Pato plays underwater with Octopus and Whale. / Everyone's preparing for a painting exhibition. Pocoyo and Pato pretend to be monsters; Pocoyo and Pato ice skate; Pato is leaving; Pocoyo wants to play ball but Pato wants to play on the see-saw. Pocoyo sees a horse! / Elly hosts a tea party, but no one wants to go. / The gang has a talent show. / Pocoyo shows his pals his favorite memories. Season 3 of Pocoyo has 13 episodes. Because different Netflix countries have different availability for episodes, you'll need to check the episode listing below to see which are available in Canada. Season 4 of Pocoyo has 6 episodes. Because different Netflix countries have different availability for episodes, you'll need to check the episode listing below to see which are available in Canada.